You may have heard, the first "from manufacturer" Linux tablet, the BQ Aqaris M10, has finally shipped. I say "from manufacturer" because many people, including myself, have taken other tablets that originally shipped with Windows or Android on them and installed Linux. While you get a certain satisfaction from doing that, in general things don't work as well as you'd like because you can't get the right hardware drivers for the tablet in many cases. The BQ Aquaris is a bit different in that regard. 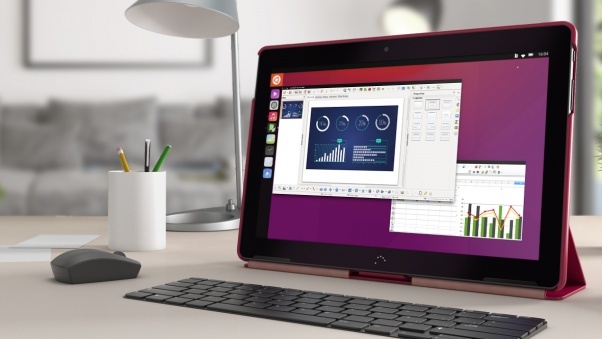 They've already shipped about the same tablet before running Android, but BQ has specifically tuned this to run Ubuntu. It's also different in that if you connect a keyboard, mouse and monitor it gives you a full desktop environment, similar to what you're used to. Now, don't get confused. This is not an Ubuntu desktop once you connect the peripherals. While it gives you the same feel, the applications you can run out of the box are a bit limited due to the CPU being ARM based instead of Intel (MediaTek MT8163A.) As an enterprising Linux master, no doubt you can compile about anything you want to run on it, if Ubuntu doesn't provide a package for it. Unfortunately from what I understand if you do that you break the OTA (Over The Air) update system built into it, much like you do if you root your Android phone. Ubuntu Touch is getting closer to a nice polished product, but still leaves a bit to be desired. Despite the fast CPU in this thing (for a tablet) the UI seems to lag a bit at times. Ubuntu Touch just isn't as mature as Android, so no doubt optimizations to this will take a bit of time. The lack of a home screen in mobile mode is a bit disconcerting, and requires a bit of a paradigm shift in thinking. If devices like this take off though, I have no doubt someone will provide a way to change the mobile experience to be more traditional. The power adapter is Euro only. 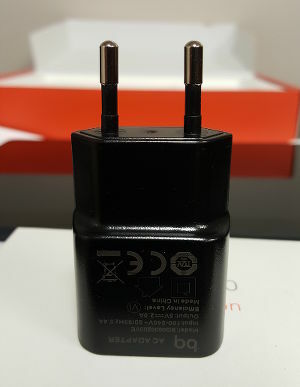 I had assumed with a destination shipping address of the USA I'd get an appropriate adapter. As it is, I don't think I have a 2A USB charger I can use with this. Obviously it comes from Spain and I should have expected this. I had expected the case to have a magnetic closure like my Nexus tablets, but it doesn't. It's a very well designed case though, regardless. The unlock code is limited to 4 digits. Contact app would force it to portrait mode when opened while in tablet mode. If I connect to a keyboard, it will then run in landscape. There's a phone dialer app. Why? The Bluetooth and 5G wifi wouldn't work until the second boot of the tablet. Only 2.4G wifi would work at first and Bluetooth wouldn't turn on. Goes into desktop mode as soon as you attach a keyboard, NOT when you attach an external monitor. Personally I'd like the option of using a keyboard with the small screen and not have to squint. Apps like Gimp won't run in multi-window mode, even when using the Desktop convergence mode. All windows get put in an "xmir root window" and that's the window title bar, too, when in desktop mode. HDMI output doesn't work if the USB power cable is connected first. You must disconnect the USB cable, connect the HDMI cable, then re-connect the USB cable. Otherwise you get a black screen AND the tablet screen goes away. Waking up from sleep, the previous item catches you again - disconnect the USB, disconnect the HDMI, reconnect the HDMI, reconnect the USB. Considering even when on power it goes to sleep very fast, this alone would be way too annoying to use as a desktop replacement. USB connection to transfer files didn't work until I rebooted my Ubuntu desktop after connecting the tablet. This may be more of a fault of the desktop, but it's also Ubuntu and I have never had this issue with my Android devices. LibreOffice (and most of the UI in general) seem very, very sluggish. After playing in Desktop mode for a while, it got stuck in Landscape and only a reboot would fix it. Will It Replace my Nexus 9? Based on cursory usage I'd say it won't replace either my Nexus tablet or my Desktop, but it's getting us closer to the possibility of a single convergence device running Linux. Really the limitation is more from the applications and less in the format or hardware. The desktop interface is ok, but you can't just install any Ubuntu packaged application you would like without having to jump through significant hoops. It also doesn't have enough memory to run more memory intensive things like the Eclipse IDE, even if you were to get everything compiled for ARM. You're also limited to a total of 74 GB of data storage once you add a MicroSD card, unless you use a full sized USB storage device over the Micro-USB OTG socket. Couple those limitations with the lack of some applications I've come to rely on in Android and it feels like the worst of both worlds right now. The coolest worst of both worlds you can buy. Honestly my Nexus 7 2012 comes closer to convergence by at least running almost all Android apps and having and HDMI output, bluetooth keyboard and mouse support. I knew going in that this would be bleeding edge, and I plan to compile my own applications for the tablet to get around what I'm missing, however there is a lot to like about what comes with it as well. But out of the box for media consumption (web browsing, email, music, etc.) it's ok while still giving you some basic media creation (documents, spreadsheets, etc.) abilities.